Jenelle Evans has a bit of a rocky history when it comes to self-medicating, but in recent years, she’s significantly cleaned up her act. … At least, that’s how it seems! Now fans are wondering if this new image reveals she’s not so clean. 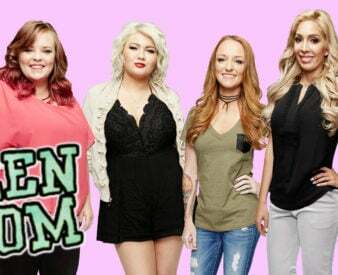 Over the years, the tone of Teen Mom has shifted quite a bit. What started as a docu-series that followed the lives of eight girls as they struggled with the ramifications and joys of a teenage pregnancy has quickly shifted into something else. As the cast members became more and more famous, the drama of their love lives, wealth, and fan interaction became more prominent. It’s no surprise that the cast themselves have changed a lot with their newfound fame. Many fans believe that this fame and attention may have gone to some of the cast members’ heads, while others use their reach for different causes or advertising. But many of them have also become much more private about their lives as their fame continues to grow. Some members of the cast have realized that some elements or choices in their lives aren’t particularly popular among fans, and have decided to keep things off of the show. In fact, fans have become increasingly frustrated with stars like Kailyn Lowry who have started more and more to refuse filming about any topics they don’t like. Of course, there are still the cast members who seem to forget that they’re ever on camera.